Looking for more than a box? Want to decorate room with Paintings? This Accessory Case is one of YAMADA HEIANDO's top sellers, often sent as a unique quality gift. We hope you will find it favourable as well. We are the proud purveyor of tableware to the Japanese Imperial Household. 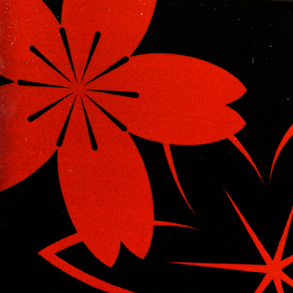 YAMADA HEIANDO is a Japanese lacquerware brand, with more than 90 years of history and traditions. Founded in 1919 in Tokyo, Japan, we have always been serving the finest lacquered products, varying largely from classic set of tableware to modern line of stationery. Our customers include the Japanese Imperial Household, Foreign Embassies of Japan, and renowned places of worship. In the hope that more people will feel connected with the art of lacquerware, we tell stories of contemporary lifestyle to the world via varieties of innovative line up. We have been the leading company in Japanese lacquerware industry, standing out from others for our clear sense of time. This accessory case, created with lacquer coating techniques of traditional Japanese craftsmen, is the perfect proof of YAMADA HEIANDO's continuous innovations. We wanted to introduce lacquerware as an everyday item, something that you can easily use but still cherish profoundly. Aiming to blend in with contemporary life of people all over the world, we decided to make a case to store accessories in. Every accessory - necklaces, bracelets, rings, and earrings - has a special episode attached, that reminds you of someone and makes your heart warm. Such feeling of close attachment is universal, we believe. As for the design on the lid, we have prepared thirteen variations in total. Every motif, hand-painted by our renowned craftsmen, depicts a classic sign of good luck in Japan (Further stories will respectively be explained in the middle of this page). You can collect them all and coordinate to accessories you are putting in, or you can select a design that best suits your gift accessory and give it as a present to your loved ones. What is URUSHI? All of YAMADA HEIANDO's products, from classic set of tableware to modern line of stationery, are finished with a traditional Japanese technique of lacquer coating. The technique applies sap of a specific lacquer tree called URUSHI (Rhus Verniciflua). The history goes as far back as 3.4 million years ago, when the lacquer sap was used as an adhesive in Asia during the Stone Age. It was us the Japanese, however, that first recognised the beauty inherent in lacquerware. We refined the coating technique to the level where it became nothing but art. Today, such distinguished craftsmen, including ones in YAMADA HEIANDO's ordinary of course, are entitled as a "Certified Traditional Craftsmen" from the government. We have been - and will always be - creating innovations with new varieties of lacquerware, representing contemporary lifestyle both in Japan and over the world. The Finishing Sparkles on Lacquerware. Typical examples of lacquerware were ones with finishing called MAKI-E. 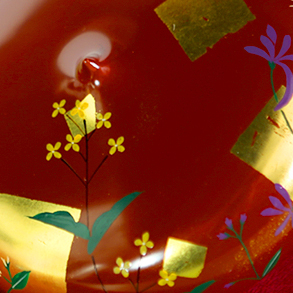 It is a traditional Japanese technique of gilding, to draw three-dimensional pictures and designs on a lacquered surface. Only meticulousness of the finest craftsmen can create this work of art, by portraying classical motifs in lacquer on a pre-coated model and sprinkling gold and silver leaf on top. This beauty of Japan has been fascinating people all over the world, including Maria Theresa of the Habsburg dominions and her daughter Marie Antoinette. The two celebrities were so passionate that they set an entire room full of lacquered luxuries in the Schönbrunn Palace and the Palace of Versailles respectively. Maria Theresa even preferred lacquerware to "everything in the world, all diamonds." They referred to lacquereware as "Japan," after respect and admiration for the glorious country of the Far East. With an impressive luster of lacquer coating, our accessory case will fit well into your palms. You will also be surprised to feel how light - but durable at the same time - it is. We have covered the inside with a smooth felt lining, so that your accessory will not get scratched. Black lacquer comes with a red lining, and red lacquer with violet lining. On the back of each product, we carefully stamp our original logo in gold, to prove that it is the genuine lacquerware of YAMADA HEIANDO's (As for this accessory case, only the lower case has a logo on the back; there is no logo on the upper case). YAMADA HEIANDO's items are the perfect gifts for every occasion and recipient, with our original wrapping to make your gifts special. Because we want our items to contribute to both givers and recipients to become happy, we will send all items gift wrapped (We do not charge extra for wrapping. It is free.). Your order will usually be shipped within 2 business days after your payment has been confirmed. The final shipping schedule may differ depending on the destination country, but you can well have your item when you want it. Handling Manual will be included. Don't worry even if it is your first time to use lacquerware - We will send with each item a compact handling manual. Written inside are the fundamental philosophy of YAMADA HEIANDO, the history of lacquerware, and easy steps of how to take care of them in daily life. Shipping charges will be added during the order process (See details). You can change quantity on the next page. Consumption tax will be added to delivery within Japan. Please feel free to contact us if you have any questions regarding this item. We will soon get in touch with you from global@heiando.com (Add us to your address book to ensure our emails will be sent to your inbox.). MOST POPULAR CLASSIC SOUVENIR from Japan. 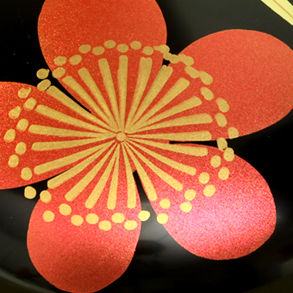 It conveys the essence of Japanese aesthetics with its UME rose design, traditional flowers which symbolise good luck. Experienced artisans use ultrafine gold powders to hand-paint petals one by one. that is favoured by Japanese Emperor and other renowned collectors. Based on 18th Century Master Artisan Ogata Korin's "National Treasure" painting, it brings back the beauty of Japonism from times of van Gogh, Klimt, and Monet. Go to our online help desk.